“There he is!” said Bennett in a startled whisper. Looking between the branches we saw the tall, erect figure emerge from the hall door and look around him. He stood leaning forward, his hands swinging straight before him, his head turning from side to side. The secretary with a last wave slipped off among the trees, and we saw him presently rejoin his employer, the two entering the house together in what seemed to be animated and even excited conversation. 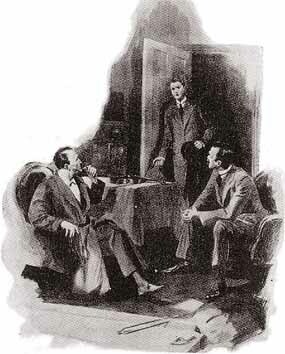 Holmes stopped at a post-office and sent off a telegram on our way. The answer reached us in the evening, and he tossed it across to me. Have visited the Commercial Road and seen Dorak. Suave person, Bohemian, elderly. Keeps large general store. MERCER.